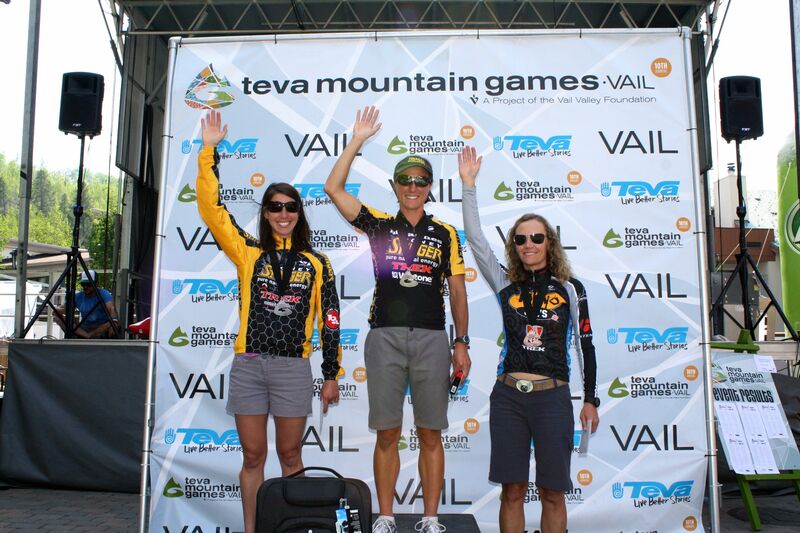 Ahh, the Teva Mountain Games – a very special event for me and Ian because it’s where we met in 2002. We haven’t missed a single TMG since, whether I raced, Ian worked, or both. Ian’s parents arrived before the event to help with the kids while I raced and Ian worked throughout the long weekend. I was able to paddle the down river race course a few times before the event helping me have a little confidence on the water (I’ve only kayaked once since this race two years ago). Ian and I were also able to get one quick lap in on the mountain bike course and then it was time for me to hang with the family and try to relax. Down River Kayak Sprint – Saturday morning: We all convened in East Vail, listened to a brief racer meeting and joked around to hide our pre-race jitters. Gretchen Reeves, Kelley Cullen and I all raced back-to-back at one minute intervals allowing us to judge time lost or made. 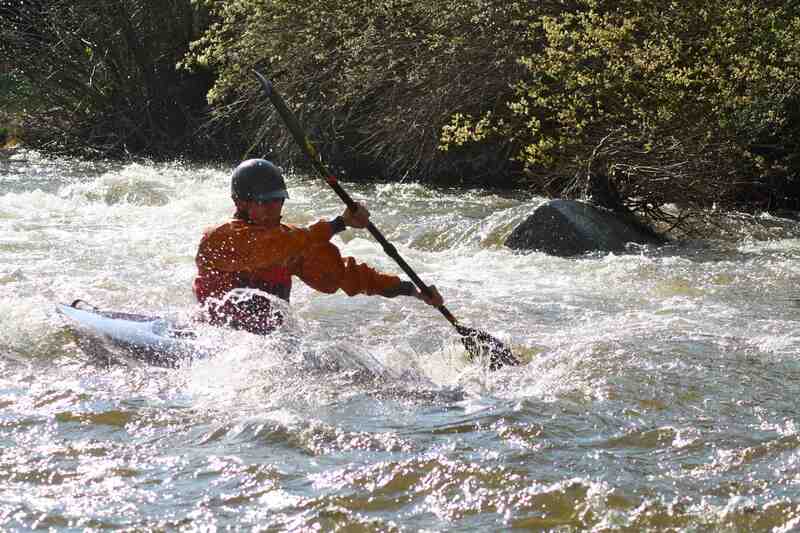 I went first and within the first few minutes I caught an eddy line with the bow of my boat and spun backwards. Getting moving forward again very quickly, I finished the rest of my run with better lines. Shortly after, Gretchen and Kelley came in together. After the first race I was up 20 seconds on Gretchen, and 1 minute 20 seconds on Kelley. X-Country Mountain Bike – Saturday midday: I took Juniper into town for a ride on the zipline and enjoyed a few minutes of the event. With a quick hand-off of the kids, I warmed up for race #2. An additional Ultimate Mountain Challenge competitor, Sara Tarkington, joined us at this point. Sara had never kayaked before so opted out of the paddle and took the 30 minute penalty instead. As we started up the first climb with the other women racing in the pro division, I instantly worried that my legs were destroyed from the 50K as I fell off the pack. After just a few minutes I started to come around and catch some the women. By midway through the first of four laps, I had managed to catch and pass my three competitors in the Ultimate Mountain Challenge. Both Gretchen and Kelley stayed close behind for the remainder of the race, pushing me and the pace the entire way. Despite having some chain issues, I managed to stay in front and gain a little more time thanking my new awesome race bike – the Trek Superfly Elite. 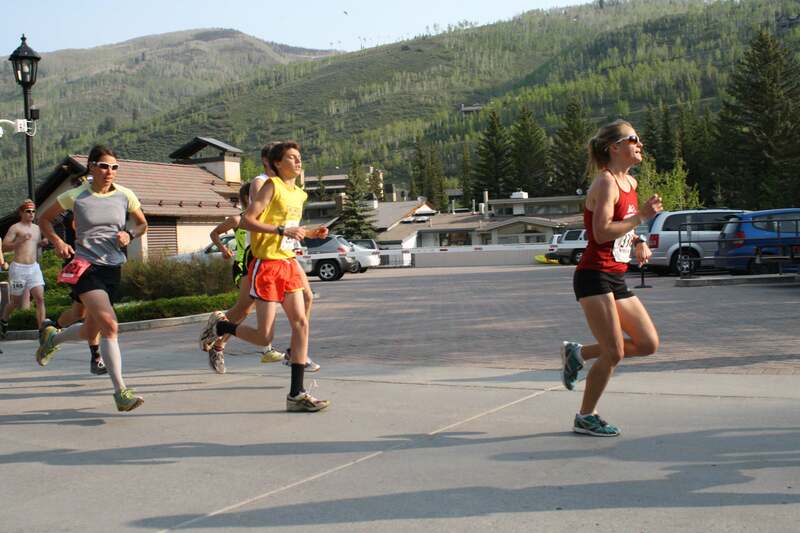 10K Spring Runoff – Sunday morning: I did some rough math in my head before the run began and figured I had about 1 minute 20 seconds on Gretchen and about 2 minutes 30 seconds on Kelley. My goal for the 10K was to run as well as I could and try not to let either Gretchen or Kelley get ahead of me. 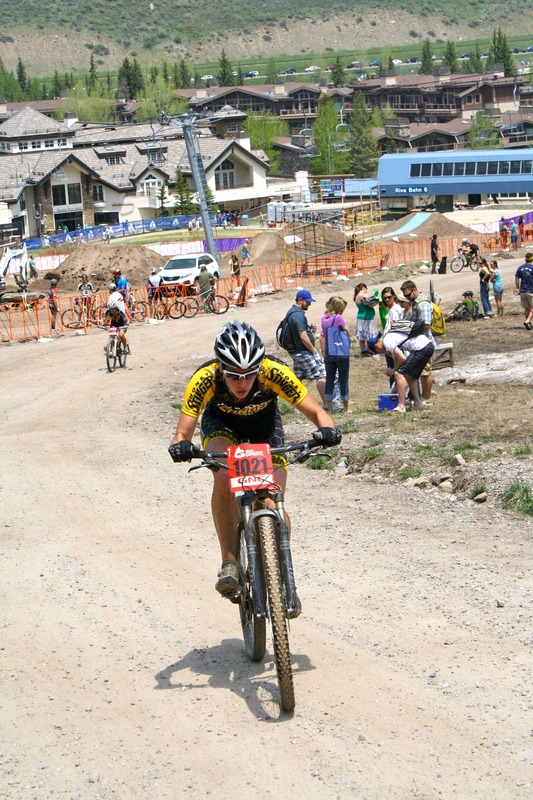 That goal ended very early in the race when Kelley passed me on the first climb and proceeded to drop me. I stayed as close as I could but my running legs just weren’t there. My goal became to stay ahead of Gretchen and minimize my loss to Kelley. In the end, Kelley ran a great race and finished 5 minutes ahead of me putting her two and a half minutes in the lead. I was relieved that I was able to stay in front of Gretchen and was hoping I could pull something amazing off in the time trial up Vail Pass. Road Bike Time Trial – Sunday morning: With only an hour between finishing the 10K and starting the time trial, I hoped for a miracle on my road bike. Kelley was starting 30 seconds behind me and Gretchen 1 minute back which meant if one of them caught me, I wouldn’t be able to pull off the overall win. I knew the chance of me making up two and a half minutes on Kelley was slim but I gave it everything I had. Which, as it turns out, was just about nothing. Gretchen passed both Kelley and I very early on and then Kelley passed me about a mile before the beginning of the bike path. I struggled to maintain any speed and felt like I was never going to reach the finish. Gretchen and Kelley were not in sight and I just hoped I hadn’t lost second place. In the end, I maintained my silver medal as Kelley Cullen took a brilliant win in her first attempt at the Ultimate Mountain Challenge and Gretchen Reeves finished third very close behind me. Results here. It was an exhausting but great weekend of racing and now I am thoroughly excited to take a few weeks off. Ian and I are headed to France for a Polartec Athlete Advisory Board meeting, as well as some road riding and hopefully a little bit of relaxing.